Thanks to the influence of Tony Vincent I've started to see the utility of adding emojis to documents and graphics. Scroll through Tony's Twitter feed and you'll see lots of examples of classroom uses for emojis. Here's one recent Tweet in which Tony shared a little activity he developed for students to complete by guessing the school term based on the emojis displayed in a graphic. 💥 There is not an emoji for everything, so symbolically representing vocabulary can be a stretch—a really big thinking stretch when you’re the one developing the representation. You could build a similar type of activity in Google Documents through the use of the special characters menu. Watch my video to learn how you can easily insert emojis into your Google Docs. Earlier this week I learned about a new bibliography creation tool called MyBib. MyBib is an open source project. Unlike some of the big names in the bibliography generator market, MyBib doesn't charge a fee for their advanced features like exporting your bibliography to Google Drive or using a citation style other than MLA or APA. MyBib can create citations and bibliographies in a wide range of styles including the popular MLA, APA, Chicago, IEEE, and Harvard styles. Watch my video to see how your students can use MyBib to create bibliographies. Google Slides has come a long way since its early days as a bare-bones slideshow tool. Today, it is packed with features. Some of those features are obvious and others are hidden away in menus that are frequently ignored. 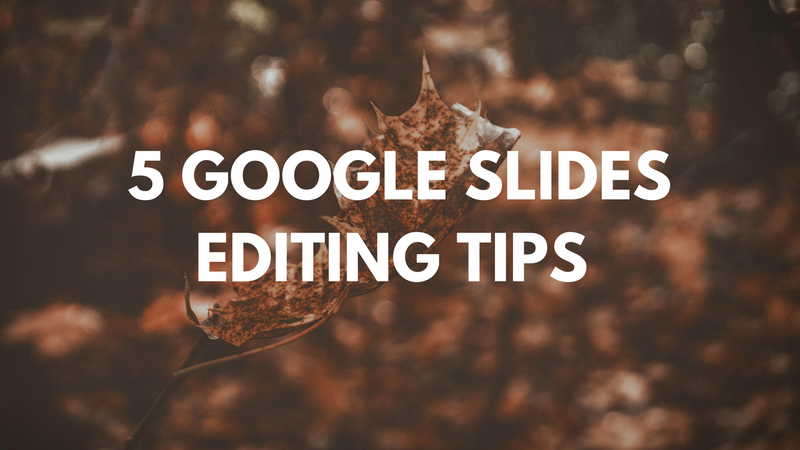 In the following video I provide an overview of five Google Slides editing tips. Setting background colors and images. Editing images in Google Slides. Inserting emojis into Google Slides. Quickly centering objects on a slide. Animating elements within your Google Slides. Kahoot has just announced a feature that teachers have requested for a long time. You can now upload a spreadsheet of questions to create a game in Kahoot. To do this you have to use Kahoot's spreadsheet template. I think that after you've used the template a time or two writing quiz questions and answers will be faster in a spreadsheet than in Kahoot's current game builder (which you can still use). Spreadsheet importing is not the only new feature that Kahoot announced today. Kahoot's mobile app now includes access to a library of 2,000 free images that you can include in your Kahoot games. This library was previously only available when creating games in the Kahoot website. The navigation within your Kahoot account was updated in this latest round of Kahoot improvements. Your account will now has a streamlined display of games you've created, games you have "favorited," and games that have been shared with you. The following video provides an overview of Kahoot's new features. I recommend turning off your volume when you watch the video unless you really feel like listening to that annoying Kahoot music for two minutes.